At the losing end was Computec/ Comsports Masters. Their victory came in the second half of play from a diving header from Randy Patrick, which was the lone goal of the match. Patrick, a former national defender, now a certified coach, was adjudged the Most Valuable Player of the Final. African Tref pocketed $3,000, a trophy, medals and, of course, bragging rights. Computec/Comsports Masters earned $2,000. Tref earned the right to the Final with a 1-0 win over last yearâs winner SESCO, while Computec/Comsports Masters recorded a similar win over Calliaqua Masters. In the third place play-off, Calliaqua made certain that they ended in the top three, with a 3-2 win over SESCO. But SESCO has a consolation, as Tyrone Prince was the leading goal scorer. 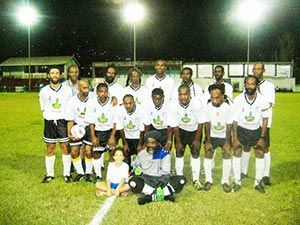 Prince, a former St. Vincent and the Grenadines midfielder, struck the back of the nets 13 times. Selwyn Charles, of South Leeward, was voted the competitionâs Best Goalkeeper.